The driver revs the mighty 690hp V-12 Maybach HL230 P30 engine, and the tank destroyer noses forwards. The tracks of the 50.15-ton Jagdpanther clank across the muddy soil until it has taken up its ambush position along the tree line. The gunner aims the long-barreled 8.8cm PaK 43 gun at the approaching platoon of enemy tanks while the commander watches through binoculars from his open hatch. With a spurt of flame and an explosive noise, a shell speeds towards its target with unerring accuracy……Based on the Panther, and with a low profile and sloping armor, Germany’s Jagdpanther was a very successful design. It mainly saw service on the Eastern Front, though it was also widely used in the Ardennes offensive, and the Allies first encountered it in Normandy in the summer of 1944. One of Dragon’s biggest 1/35 scale releases of the year is a Jagdpanther Early Production version. This exciting new Jagdpanther bears absolutely no connection with Dragon’s decade-old Imperial series kit, though it does make use of top-quality parts such as road wheels, track links and on-vehicle tools from the recent, scorching hot Panther G! Other components have been built from scratch according to the latest research and investigation. 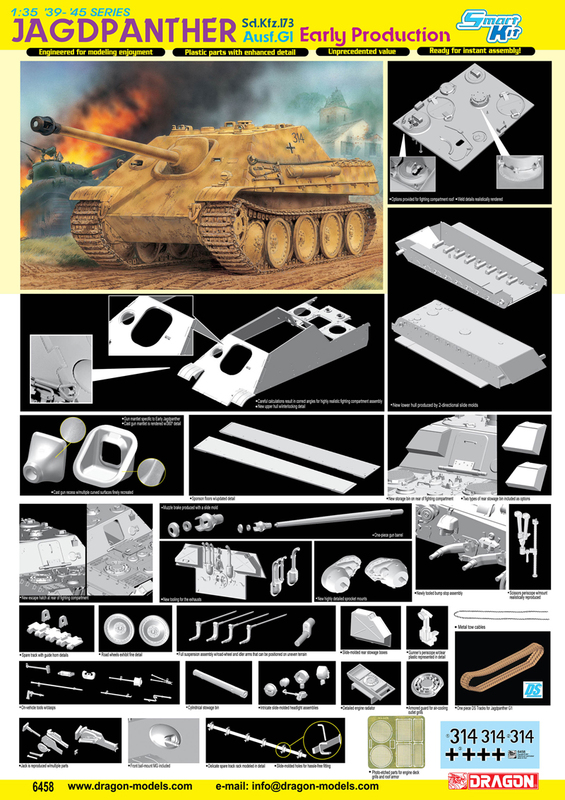 The Jagdpanther is in the Smart Kit line, meaning it is extremely well engineered for easy assembly and well-fitting joints. Particular attention has been paid to the mantlet armor collar and mantlet with their complex curved shapes, thus making this the first Jagdpanther to accurately reproduce these parts in kit form. Every part has been given a thorough treatment during the kit’s design, right down to the smallest nut, bolt and weld seam. This Jagdpather is destined for great things…it’s a legend in the making!